3 night safari : Witness the migration of wildebeest and zebra as they make their way to greener pastures in the Masai Mara Kenya. The spectacular Great Migration has been described as ‘the greatest wildlife show on earth’ – with up to 1.5 million animals moving across the grasslands, pursued by large numbers of predators. 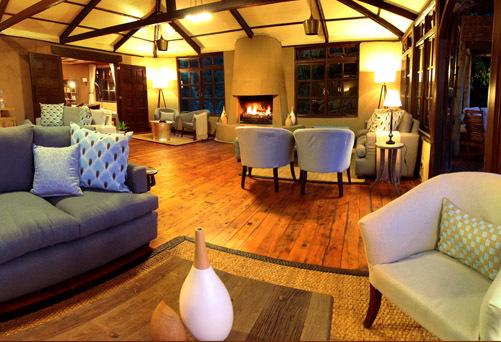 The luxury camp chosen for this experience is one of the finest in all of Africa. On arrival at Jomo Kenyatta International Airport a Sanctuary Retreats representative will greet you and you will be transferred to the domestic Wilson Airport, about 15km southwest of the city. Your scenic flight to the beautiful Masai Mara takes only 45 minutes. The Masai Mara National Reserve is one of Africa’s greatest and most famous parks. 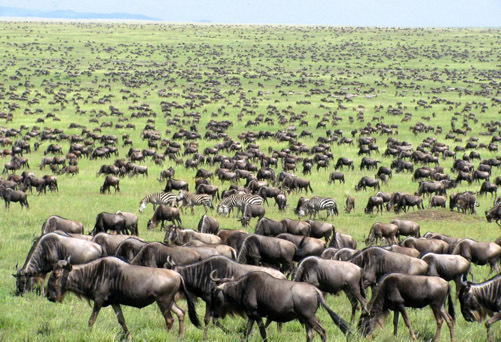 It is the arena for one of the most breath-taking events on the planet – the Great Migration – that involves the largest mass movement of land mammals anywhere. Millions of wildebeest follow an annual circular route around the Serengeti Ecosystem in an endless quest for fresh pasture and water. The migration is usually present in the Masai Mara between July and October. It is a sight to behold as you weave through the herds on your way to the camp. 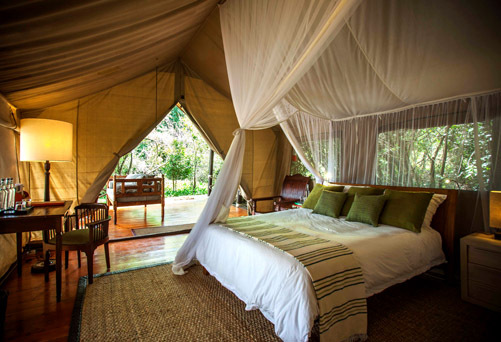 On arrival at Sanctuary Olonana there is time to relax and freshen up in your tent before lunch is served. The tents are very spacious and have floor to ceiling mosquito netting, en suite bathrooms with hot showers, flushing lavatories, solar lighting and large verandas with great river views. The main dining room and veranda commands a dramatic stretch of the Mara River providing the perfect setting for breakfast, afternoon tea and after dinner star gazing. After lunch there is time to relax in your luxury home for the next four days, and guests will then proceed for the first game viewing drive of the day. After breakfast at the camp, accompanied with your picnic lunch, you will leave with our expert guides to explore the Mara for the better part of the day to understand the reasons why the great migration takes place every year. The Mara is a fabulous place, the plains offers rich food for elephants amongst the thousands of herds of wildebeest and topi, zebra, eland, buffalo as well as Thomson’s and Grant’s gazelle. Adding drama to the already extraordinary spectacle, the Masai Mara is known for its big cats. Lions, hyenas, cheetahs, leopards, wild dogs and jackals prepare themselves patiently for their share of the banquet. Beware also of crocodiles, they lay waiting for young calves who struggle against the strong tides of the Mara River. You can also walk with our naturalist guide and learn about plants, trees, insects and even how to approach animals on foot. Your guide can show you how to spot animal signs which are everywhere but not easily noticed. You will then return to camp and spend the late afternoon at leisure. Relax by the pool or revitalise at our mini-spa which offers a range of treatments from facials to body massages. Sanctuary Olonana has earned a gold award from Ecotourism Kenya for its pioneering wetlands project. You can visit the wetlands which cleans wastewater before returning it to the natural environment. There is also the opportunity to take part in our tree planting initiative where one can purchase and plant an indigenous tree, leaving your positive mark on a piece of Africa. During your stay at Sanctuary Olonana there are a variety of activities that can be booked on request. 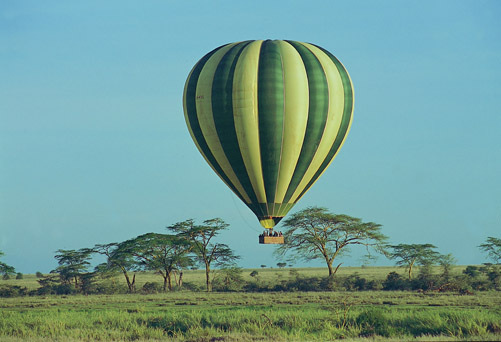 One possibility is a breath-taking balloon safari. Float gently over the plains with a bird’s eye view of the game below as the sun rises slowly over the horizon. After around one hour the balloon lands and a full breakfast is served in the middle of the bush with glasses of bubbly to toast your flight! An adventure on Lake Victoria is another option. Take an early flight by light aircraft to the lake. Try fishing for the legendary giant Nile perch found in these waters as you explore the beautiful islands or stop at a traditional fishing village and see how the villagers live from day to day before flying back to the Masai Mara. On your last evening drive out into the bush, a private and secluded clearing is prepared for an elegant dinner in the middle of the wilderness. Candles flicker in the darkness, as your waiter serves a delicious bush dinner. After dinner you can retire to the warmth of the campfire where brandies and liqueurs are served as guests relax and absorb the peace and beauty of the African night. Spend your morning game viewing in the Masai Mara and return to camp for lunch. In the afternoon your guide will transfer you to the airstrip for your flight to Nairobi’s Wilson Airport. On arrival you will be met by a Sanctuary Retreats representative and you will drive the short distance to Nairobi’s Jomo Kenyatta International Airport for your departure flight.